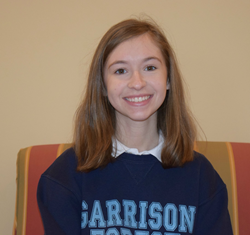 Channing Capacchione, junior at Garrison Forest School (GFS) is one of seven students in Maryland to qualify for the second round of the North American Computational Linguistics Olympiad (NACLO). “NACLO puzzles give students an opportunity to learn about how these systems work and how computational linguists approach questions in their day-to-day research. Channing Capacchione, junior at Garrison Forest School (GFS), an all-girls’ K-12 independent private school with boarding and a coed preschool in Owings Mills, Maryland, is one of seven students in Maryland to qualify for the second round of the North American Computational Linguistics Olympiad (NACLO). NACLO is a challenging competition in which middle and high school students solve linguistic puzzles. On March 10, 2016, Channing competes in the invitational round at Johns Hopkins University, where she competed in the open round in January. With a ranking of 71, Channing is one of only 174 students in the United States and Canada out of 1,700 students to qualify for round two. “I was surprised that I made it to the second round,” says Channing, who is in Pre-Calculus and AP Latin and co-head of the Latin Club. “I didn’t study for it and wasn’t expecting to qualify. I enjoyed the exam since I enjoy puzzles and languages and was able to use clues and decode languages new to me on the test.” She took the NACLO in 8th Grade, and in January 2016, was one of seven GFS students to compete in the open round (a total 15 Baltimore regional students tested at Hopkins in January). Garrison Forest leads Baltimore’s independent private schools in participation years and numbers, with students from 6th grade through AP-level students willing to tackle the rigorous NACLO test, mostly for the fun of the intellectual challenge. The invitational round on March 10 is a four-hour exam. Fewer than ten scorers from the U.S.A. and Canada are likely to advance to the International Olympiad in July, one of 12 international science Olympiads. To create the exam, professionals in linguistics, computational linguistics and language technologies use dozens of languages to develop engaging problems that represent cutting-edge issues in their fields. The Hopkins graduate students who administer the NACLO routinely tell the students that it's the hardest mental test they've ever attempted. In addition to a love of languages, Channing excels at science and in the arts. From September 2015 to January 2016, through GFS’s Women in Science and Engineering (WISE) research partnership with Johns Hopkins, she conducted weekly research in brain perception science in The Johns Hopkins Krieger School of Arts & Sciences’ Department of Psychology and Brain Science. There, she studied visual memory research as it applies to witness investigation. Last summer, she conducted research on advanced upper limb prosthetic devices at the Uniformed Services University of the Health Sciences in Bethesda. Channing is an accomplished filmmaker, art editor of the GFS literary magazine, award-winning poet—she won four Scholastic Writing Awards in February—and copy editor for the yearbook. In addition, she leads tours for the admission office and mentors GFS Middle School and younger high school students on issues around relationships and other issues through the school’s Peer Educator program.